Facts about Charlene Strawn water lily plant. Charlene Strawn, a water lily lotus, is an aquatic plant that can grow from a height of one foot to five feet (.30 to 1.52 meters). It comes from a hybrid of two natives, Nymphaea odorata and Nymphaea Mexicana. Charlene Strawn water lily is fragrant free flowering plant with its blossoms being cream yellow in color with pink over tones. Charlene Strawn water lily cream yellow flowers blossoms to form star shapes and grows to a height of about twenty four inches (61 cm). In addition, it lasts for several days closing at night and in the late afternoon. This plant spreads four feet (1.22 meters) and grows to a height of about twelve inches (30.5 cm). The Charlene Strawn normally holds its flowers above the water surface. It has dense foliage and does not require a facer plant in front. Charlene Strawn water lily leaves are green, simple and orbiculate growing approximately eight to nine inches (20 to 23 cm). Its leaves can last up to six weeks before it turns yellow. The plant can survive for about ten years. The Charlene Strawn water lily plant is an evergreen herbaceous perennial lotus which spreads slowly the surface of water and has a low growth rate. Charlene Strawn water lily grows in a still water approximately eighteen inches deep and spreads through rhizomes. Lotus plants require full sun for best results of establishment. 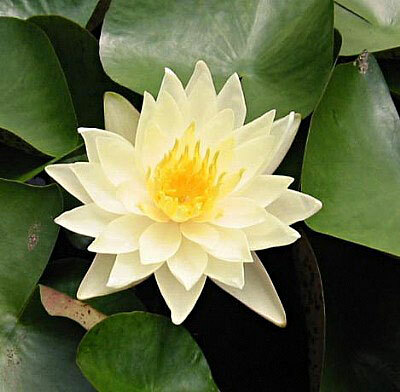 However, the Charlene Strawn water lily can produce some blossoms with only five to six hours of direct sunlight. The Charlene Strawn water lily plant can establish well in small to medium ponds. It can also be grown in water gardens or even containers. It is important to note that the Charlene Strawn water lily is tolerant to urban pollution and can do so well in good soils which are properly drained. It also requires special planting and care practices.